Temperament: The Papillon is a friendly, gently, affectionate, intelligent, happy, lively, vivacious, alert dog that should be neither shy nor aggressive. Papillons are typically playful and amusing yet can be calm and patient when they want to. Family Dog: Papillons are not recommended for families with small children. They do best with older, well-behaved children. Some Papillons can be somewhat dog-aggressive but generally dog well with cats provided they are raised together from puppyhood. Shedding: Papillons are average shedders. Grooming: The Papillon's long, silky coat requires daily brushing. This breed is usually clean and odorless and should be bathed or cleaned with a dry shampoo when necessary. Their nails should be clipped regularly. Papillons need to have their teeth cleaned regularly because they tend to have tartar build up. Training: Papillons take to training fairly well and can be taught to perform small tricks. They can be difficult to housebreak. Barking: Papillons are typically not yappers. Exercise: Papillons require a daily walk and will also enjoy a good romp outside in a safe or fenced in area. Living Conditions: Papillons make great city dogs but are not recommended for apartments or other close quarters as they are very protective and many bark excessively at nearby noises. Appearance: The Papillon is a lively, dainty, friendly, elegant, little toy dog with a fine build and notable butterfly-like ears. 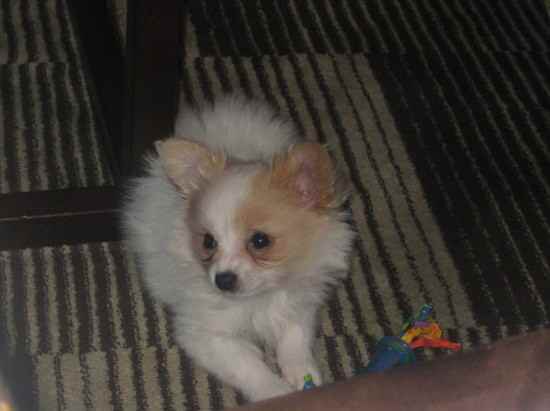 Size: The Papillon should be 8 to 11 inches tall at the withers and weigh between 7 to 9 pounds. Head: The Papillon has a small head that is slightly rounded between the ears with a well-defined stop and an alert expression. Nose: The Papillon's nose is small and rounded with a flat top and black in color. Eyes: The Papillon has medium-sized, dark, round eyes that should not appear bulging with black rims. The inner corners of the eyes are in line with the stop. Ears: The Papillon has large ears with rounded tips that can be either erect or drop type. Both types of ears should be set on the sides toward the back of the head. Ears of the erect type are carried obliquely and have the appearance of spread butterfly wings. They should have sufficient leather to maintain their position. When the dog is alert they are carried at approximately a 45 degree angle to the side of the head. The drop type ears also known as Phalene, are similar to the erect ears but are carried drooping completely down. Muzzle: The Papillon's muzzle is fine and significantly narrower than the head tapering as it approaches the nose. The length of the muzzle is approximately one-third of the overall length of the head. The lips should be tight, thin and black in color. Teeth/Bite: The Papillon's teeth should meet in a scissor's bite with the tongue not being visible when mouth is closed. Neck: The Papillon's neck should be of medium length. Body: The body of the Papillon is slightly longer than it is tall with a fine-boned structure and its weight in proportion with the height. The topline should be straight and level. The chest is of medium depth, the ribs well-sprung, the belly is tucked up. Forequarters: The Papillon's shoulders are well developed and laid back allowing free movement of the slender, fine-boned and straight forelegs. Hindquarters: The Papillon's hindquarters are well-developed and angulated. The rear legs are thin, fine-boned and parallel to each other. The hocks should be straight. Gait: The Papillon has a quick, easy, free and graceful movement that should never appear stiff in movement. Feet: The Papillon's feet are thin and long, resembling a rabbit's foot. They should point straight forward and never in nor out. The front dewclaws may be removed but the rear ones must be removed. Tail: The Papillon's tail is long and covered with long flowing fur resembling a plume. It set high on the rump and carried arched over the back and may hang toward to either side of the body. Color: The Papillon's coat is always parti-color or white with patches of another color. The ears, both inside and out as well as above both eyes should any color other than white. A white blaze and noseband are preferred. The color and marking on the face should be symmetrical. The colors, patches and markings on the body are not defined by the breed standard. A Papillon should always have at least some small patches of white on the body but never be completely white. Coat: The Papillon's long, abundant, silky, flowing, straight, resilient coat lies flat on the back and sides of body with a profuse frill on chest. This breed does not have an undercoat. The hair on the head, muzzle and from the hind feet to the hocks is short and close to the body. The coat on the ears is well fringed with the insides covered in a medium length, silky coat. The fronts of the forelegs are covered in a short, close coat while the backs are feathered. The rear legs are covered to the hocks with abundant breeches called culottes. The tail has a long, flowing plume. The feet are covered in short fur with fine tufts that may appear over and beyond the toes forming a point. Life Expectancy: Papillons have a long life expectancy with some living 16 or more years. Characteristics: The Papillon is tougher than it looks. They love outdoor exercise and to be cuddled. The may be very possessive of their owner and resent outsiders. Some bloodlines have a tendency to be nervous, high-strung and timid. Their talents include agility, competitive obedience and performing tricks. Health: Papillons can be prone to problems with the rear kneecaps which may require surgery to be corrected. They may also have a fontanel which is an opening at the top of the skull similar to a human baby's "soft spot". This may correct itself but sometimes will not meaning the dog head needs to be protected. Some Papillons have a difficult time with anesthesia. History: The Papillon is one of the older breeds dating back nearly 700 years to their beginning in Europe. They were originally called the Epagneul Nain or Dwarf Spaniel and later known as the Continental Toy Spaniel or just toy spaniel. Papillons can be seen in Italian frescoes dating back to the 13th to 15th centuries. The breed was well known in Italy during the Renaissance Period and was later perfected by breeders in France.